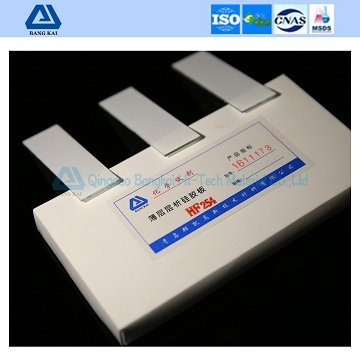 Thin layer chromatography silica gel analysis plate is the chromatographic material which using efficient silica gel powder as adsorbent, and modulating with a new organic binder, then coating silica gel on glass plate uniformly with automatic coating apparatus. It has those features: a small amount of spotting, fast separation and high sensitivity. The product is widely used in the research of pharmaceutical, chemical, biochemical, environmental, and public security system. And it has good effect on some trace as well as complex composition compounds. It is very suited for the qualitative and quantitative determination. 2, This product is strong in moisture absorption, so it should be stored in dry and ventilated places, silica gel plate after unpacking used up should be immediately sealed, so as not to absorb moisture or other chemical substances and affect the separation performance.